Many reviewers think that these Nike basketball shoes look cool. Expert reviewers and ordinary users alike are happy with the Air Flightposite’s PU insole. Several wearers are saying that these Nike shoes are very comfortable to wear. This Nike Air Flightposite gets high overall satisfaction ratings from reviewers. Testers love the fact that these mid-top basketball shoes fit true to size. The traction works surprisingly well according to some reviewers. A handful of players think that the Foamposite material in the upper is great and way ahead of its time. A considerable number of buyers think that the Nike Air Flightposite is too expensive. At least one reviewer says that these mid-top shoes are not really well-ventilated. The Nike Air Flightposite is just very enjoyable to play in. Its traction is surprisingly a stunner. The Foamposite that comprise much of the upper is said to be very supportive. It also has its PU insole that is said to be both comfortable and responsive. A common complaint about these Nike basketball shoes and others like them (e.g. the KD 11 and the LeBron 16) is their high price. But prices will definitely drop in time, so this won’t really be an issue for long. In my opinion, it's actually a really good shoe. Something that should be noted about the Flightposite series is that they are like the Hyperdunk… they are for all players and positions on the floor. I really liked these on-court. The retro versions of the Nike Air Flightposite do not really fall far from the tree. Like the OG, they feature Foamposite in the upper. They also have the conventional lacing system that is reinforced with a layer of zippered shroud. There are versions of the Air Flightposite that do not have this additional layer. They are rightfully called the ‘Exposed’ renditions of these Nike shoes. The shoes feature very comfortable PU midsoles/insoles. The cushioning setup is finished off with an encapsulated Zoom Air unit. Finally, the outsole is made of firm rubber. It features wavy horizontal lines that allow the shoe to play well on both indoor and outdoor courts. Designed by Eric Avar, this shoe was originally released in 1999. Because of the model’s appeal and overall performance, it has been retroed several times. It saw its first rerun in 2003. It was revived again in 2008, and then once more in 2013. Five years later, Nike makes another retro run of this well-loved shoe. Cushion. The Nike Air Flightposite has a Zoom Air unit that is encapsulated in a PU insole/midsole. This whole cushioning setup delivers comfort and responsiveness. The PU insole is removable. Traction. The outsole of the Air Flightposite Retro is made of a firm type of rubber. It is covered in wavy horizontal lines that are widely spaced. The lateral side of the forefoot features a fingerprint-like pattern. The shoe’s reliable traction makes it a good model for both indoor and outdoor use. Length and Width. This shoe from the Swoosh is said to be true to size. Hence, new buyers are advised to just go with their usual Nike sizes. Lockdown. The supportiveness of the shoe is brought about by its fit, which in turn is a function of the material that the upper is made of. Said to be true to size, the Foamposite upper keeps the foot securely locked in. Adjustments are made possible by the shoe’s standard lacing system. To add another layer of support and containment, the vamp is covered with a zippered shroud. There are versions of this shoe, aptly called the ‘Exposed’ versions, that do not have this added cover. To further secure the ankle, the shoe is made a mid-top. 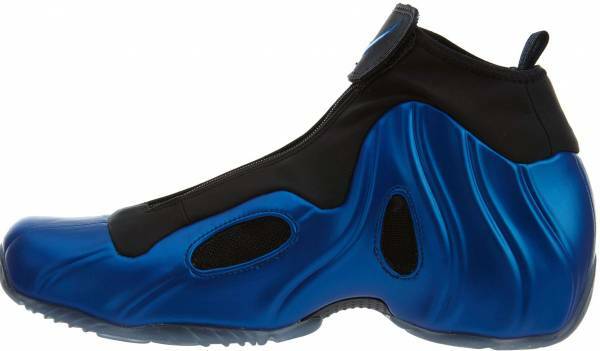 The upper of the Air Flightposite is largely composed of a proprietary material called the Foamposite. It is light, durable, and highly supportive. The Nike Air Flightposite attracts many ballers and casual wearers because of its sleek design and usually bright colors. Aside from further locking down the foot, the zippered shroud also streamlines the look of the vamp, effectively increasing the shoe’s aesthetic appeal. The soft curves and waves on the surface of the upper draw inspiration from the 17th century anatomical drawings of the body’s musculature. Allan Houston of the New York Knicks wore a White/Game Royal-Team Orange rendition of the Nike Air Flightposite. This colorway is easily among the most popular colorways of this mid-top basketball shoes. The Year of the Horse version of the Air Flightposite Exposed has a aquamarine/camo upper. It is adorned with Volt accents and what appears like strokes of reflective aqua paint. It has the Year of the Horse logo on top of the tongue, heel, and the insoles. This shoe is part of a special collection that also includes the Kobe 9 and the Air Force 1.